Who needs words with cute pics like these? :) The baby lion is so sweet. 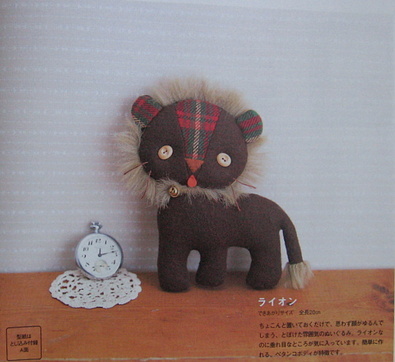 uh oh I just bought the month before and now I want this one for that lion! how adorable!!!!!!! Hope you had a good day at the beach. Just wish we had this weather at the beginning of the hols instead of the end. We've just got back from Pendle and "Witches Galore" shop. I know I'm early for Halloween but for once I'm trying to get ahead of myself. 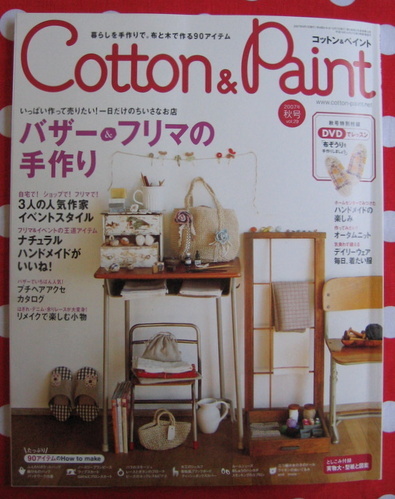 I love the way "Cotton and Paint" use such subtle colours with a pattern as a "highlighter". Those comfy slippers look just the thing for winter with wool socks or a Christmas present. That little lion is just too cute!! Thanks for sharing!!! Hope you had a great day!!! I love, love, love the lion and the serged baskets. I'm in love with that lion - have fun at the seaside. 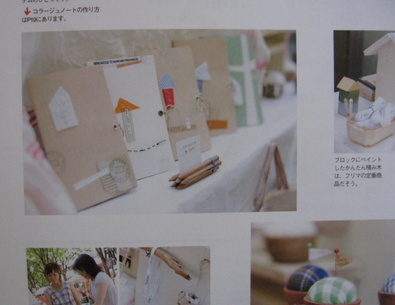 oh, i love the look of those little journals (?) with fabric covers. thanks again for so much great inspiration. I just love those Japanese pattern books - they have the freshest designs. Love all these patterns,especially the lion. 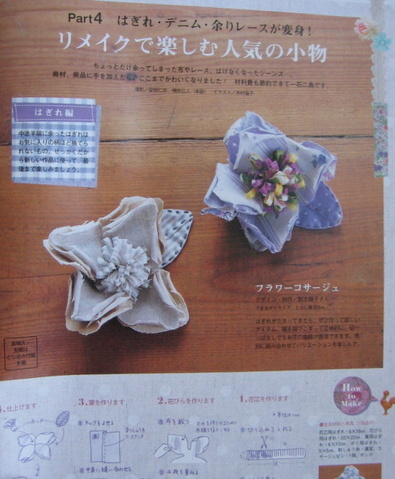 I love these fabric flowers! 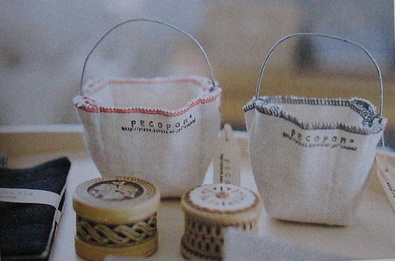 I've just been google-ing Japanese craft books I a stumbled upon your blog. That lion is just too cute. Can you recommend a good place to buy things like this online? I'd like to urge you and other crafters out there to join librarything.com ; it's a great social networking site that allows you to create a catalog of your OWN library books -- for free! You can use Amazon.co.JP to bring in Japanese books. It's a great way to share information and learn about others' books, although you can make your catalog public or private. There are a few crafters using it for J-craft books and a few (mostly inactive) discussion groups. I'd love it if more people shared information on the site. I'm not in any way connected with it, just a happy user. Oh boy, you just inspired me to get this issue too. That lion is too cute! You've probably replied to this question a thousand time but I couldn't find my answer anywhere, so here it is : where do you get cotton paint? 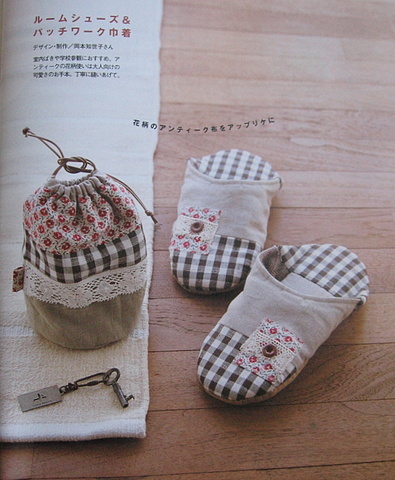 I'm obsessed with Japanese sewing and craft books and I can't get enough!! Also, I really like your blog and what you make and it is now in my list of favorites!